Choose an old fashioned ice cream sundae recipe from the collection below and experience a refreshing treat from childhood. You'll love the delicious taste of these authentic frozen dessert treats topped with fresh fruit, whipped cream, colorful sauces, and a maraschino cherry. Make a traditional ice cream parlor sundae by serving your homemade ice cream in a bowl or classic tulip glass with fresh fruit or a fruit preserve and your favorite fountain syrup or sundae sauce generously drizzled over it. The pharmacy soda jerks liberally drizzled the chosen fountain syrup over a bowl of frozen ice cream and topped it off with a generous dollop of freshly made whipped cream and a big red maraschino cherry. You'll find a collection of original fountain syrup recipes in the soft drink section on this site. These are the same recipes that soda fountain operators used when making flavoring syrups for their refreshing sodas and ice cream sundaes. Choose a syrup and drizzle it over your homemade ice cream or dessert to enjoy an authentic old fashioned treat. 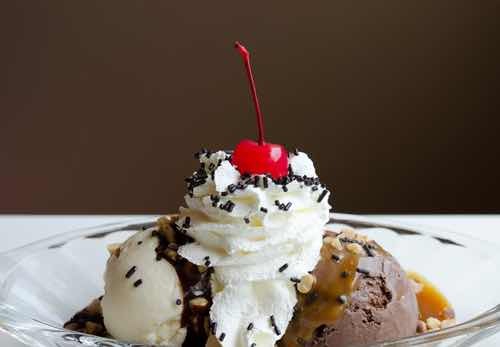 Most ice cream parlors developed their own sundae combinations to attract customers and some became national favorites. Simply use your imagination to combine your favorite ice creams and toppings. Thanks to the old fashioned ice cream sundae recipes below, you can make the traditional sundaes once served in North America's ice cream parlors and soda fountains. The fancy names were given by the sundae's inventor and promoted as a means to make the recipes more standard and uniform in soda fountains across the country. It's fascinating to see the recommended prices which appear low by today's prices, but that 15 cent sundae in 1915 would have been considered a luxury by many customers. Whenever an old fashioned ice cream sundae recipe calls for a "No. 10 scoopful," a "ladleful," "dipperful," or an ice cream "disher," simply use your favorite ice cream scoop, and the quantity will work out okay. The quantities needn't be precise; it's the taste that counts. In serving sundaes, it is important that an appeal should be made to the eye as well to the palate. It is poor policy to slap together a messy concoction. Never let the syrups run over the edge of the sundae glass. See that the handle of the spoon is not sticky with syrup. Place nuts, cherries, or knobs of whipped cream carefully on the sundae so that the effect may be pleasing. It is customary to serve a glass of iced water with all sundaes. This should not be omitted; and do not wait for the customer to ask for it. Many dispensers serve a cracker with the sundae. This is desirable, especially in many neighborhoods, but such service is not absolutely necessary. A reasonable amount of judgement must be exercised as to the kind of cracker served. With chocolate, coffee, maple, and similar flavors, a salty cracker is very acceptable, but with the fruity flavors and with fresh or crushed fruits a sweet cracker is correct. Take a dish full of chocolate ice cream (or a dish of vanilla ice cream with a layer of chocolate syrup over it). Over this place a spoonful of crushed figs and a large spoonful of whipped cream, putting on each side a Nabisco wafer. Serve in a sherbet glass with a spoon, topping off with a maraschino cherry. Take three portions of chocolate ice cream (No. 16 disher) and place them in triangular form on a flat ice cream saucer; then place some whipped cream in the center and dust over with finely chopped walnuts, or, if preferred, a maraschino cherry may be used. Price 15 cents. Take a saucer, such as are commonly used for sundaes and around its edge place five macaroons. Place a cone of vanilla ice cream (measured out with a 12 to the quart ice cream disher) in the center of the saucer. Over the ice cream pour one-half ladleful of pineapple fruit and one ounce of maple syrup. Top off with a small measure of maple sugar. This formula is especially recommended. For this ice cream sundae recipe, place a disherful of fresh strawberry ice cream in a sundae dish, pour over it marshmallow sauce, put on a spoonful of nuts and top off with whipped cream and a nice ripe strawberry. The whipped cream may be left out. Price 15 cents. In a sundae cup place a ladleful of fresh pineapple fruit, add half a ladleful of oranges cut into small slices, then nearly fill the cup with sliced bananas, placing two maraschino cherries, one directly opposite the other and across the top of the contents of the cup. Put a quarter of a dipperful of whipped cream in the center. Sells for 15 cents. Ice cream in sundae glass, chocolate flavor; slice on fresh banana around the edge, sprinkle with chopped nuts, top with whipped cream and maraschino cherry. Price 15 cents. On a sundae dish place a scoopful of chocolate ice cream. Cover with whipped cream, add three maraschino cherries and sprinkle over all a spoonful of walnut meats. In any deep sundae glass place vanilla ice cream molded out in an ice cream scoop; pour over the cream 2 ounces of grape juice; then put one large maraschino cherry on top of the cream and a spoonful of crushed walnuts on the side of the dish. Over a ladleful of ice cream in a sundae glass pour some chocolate syrup and cover with Texas pecans, almonds, and dates chopped together. Price 15 cents. Put large measure of ice cream in a tall sundae glass, cover with fresh crushed banana fruit and fill the glass with whipped cream. Place on one side maraschino cherries. Other fruit may be used if desired. Into a banana-special dish lay two good sized slices of a peach. In the center place a medium sized scoopful of vanilla ice cream. Put a spoonful of whipped cream at each side of the ice cream and cover with walnuts and a cherry. Over the vanilla ice cream put a spoonful of crushed pineapple and top with a red and green cherry. A scoop of vanilla ice cream in a sundae cup. Pour over it a thin grape syrup; top with whipped cream and a fresh strawberry. Hot, rich chocolate syrup poured over a ladle of plan or nut ice cream. A few chopped nuts may be sprinkled over the top. Price, 10 cents. In a six-inch dish place a scoop of vanilla ice cream, one of strawberry, and one of chocolate, round-bowl shape. In the center place half a Bartlett pear. Top off with a teaspoonful of whipped cream, sprinkle a few crushed pecans. Top with a cherry pierced with a toothpick. Price 20 cents. One-half ounce crushed strawberries, 1/2 ounce crushed peaches, ice cream to fill small glass. Serve with spoon. Charge 15 cents. 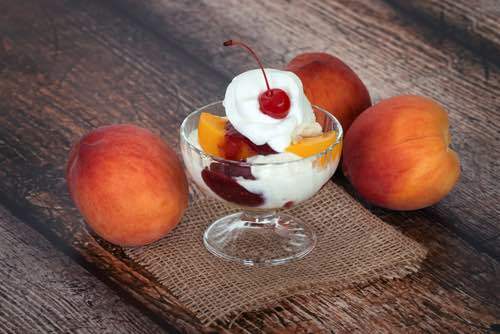 Into a suitable sundae dish place a scoop of vanilla ice cream; add a ladleful of crushed orange, sprinkle with finely chopped cherries, and top off with a whole cherry. Charge 10 or 15 cents. For this ice cream sundae recipe, place a measure of ice cream in a sundae glass, and over it artistically arrange sliced orange cut in diamond shaped pieces, sliced pineapple, maraschino cherries and English walnut halves. Charge 15 cents. Spoonful ice cream in 8-ounce stem glass. Almost fill with shaved ice. Add 2 ounces cherry syrup, top with layer of ice cream, and add a maraschino cherry. Price 10 cents. On a banana split dish place two scoopfuls vanilla ice cream, cover with crushed cherries, top with marshmallow cream and decorate with one red and one green cherry. Charge 15 cents. Take two small dishes of marshmallow cream and color (with cake coloring), one red and the other blue. Then in a fancy sundae dish put a No. 10 ladleful of vanilla ice cream; on one side of the ice cream put a spoonful of red marshmallow cream, and on the other side a spoonful of blue marshmallow cream, allowing the ice cream to show in the center of the dish so as to represent the national colors. Sprinkle a spoonful of ground nut meats on top of the dish and serve. Canadians can adapt this old fashioned ice cream sundae recipe by placing a spoonful of red marshmallow cream on each side of the white vanilla ice cream and top the patriotic sundae with a maple leaf cookie. Make a regular sundae with crushed pineapple and top with a spoonful of whole or chopped walnut meats. Price, 10 cents. Here's how to make a Dionne Surpris Sundae, an original Canadian ice cream sundae recipe that was popular throughout North America after the birth of the Dionne Quintuplets at Corbeil, Ontario, on 28 May 1934. In a banana split dish line up 5 scoops of vanilla ice cream representing Annette, Emilie, Yvonne, Cecile, and Marie, and generously top each scoop with whipped cream and a red maraschino cherry. Spoon crushed strawberries along one side of the dish and crushed pineapple along the other side, and serve. It was in 1881 while visiting an ice cream parlor in Two Rivers, Wisconsin, that a teenager named George Hallauer is credited with inventing the ice cream sundae. It's alleged that he spontaneously asked the fountain operator, Ed Berner, to drizzle chocolate syrup over his dish of plain ice cream. However, there are other credible sources that indicate the sundae wasn't invented until some time later, in the 1890s. Drinking soda water was considered improper by some Victorians and various Midwest towns even passed laws preventing its sale on Sundays. The so-called "soda suckers" were even vilified in church sermons and in the popular press at the time. Wanting a solution, a clever pharmacist in Evanston, Indiana created an alternative taste treat to sell on Sundays that contained fountain syrup and ice cream but no soda water. Meanwhile, over in Wisconsin, George Giffy, and other soda fountain owners also began to sell what were deemed "legal ice cream sodas" — that is, sodas without the soda — on Sundays, offering the customer a choice of ice cream and flavoring syrups for only 5 cents. The new ice cream and fountain syrup combination became quite popular, and people began calling it a "Sunday soda" or simply a "Sunday." 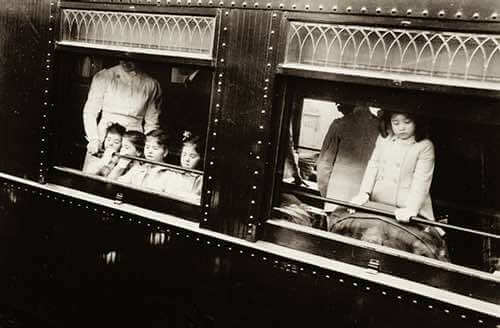 They were only sold on Sundays at the beginning, but soon people began to ask for them on other days of the week too. Soon, the spelling was changed from Sunday to "sundae" out of respect for the Lord's Day and to make the treat popular during the rest of the week. It was around this time also that the ice cream "sandwich" and the ice cream "float" appeared, but no one really knows the exact dates or who it was that invented them. Many fountain treats were developed spontaneously as customers demanded combinations of their favorite ingredients, the sundae being the most famous example. How About an Ice Cream Sundae Party? Simply set several containers of frozen ice cream into a large tub filled with crushed ice to prevent the ice cream from melting. There should be enough ice cream available to satisfy all your guests. Offer standard ice cream flavors along with a couple of the more unusual old fashioned flavours like Rhubarb Cream. Fig, and Brown Bread. Be generous with the toppings, as toppings are the most fun. Read the old fashioned ice cream sundae recipes above for inspiration. Get really creative. Have containers of sundae sauces, syrups, bits of homemade fudge, chocolates, crushed hard candies, chopped candied fruit — how about finely chopped chilli peppers for a hot and cold Mexican ice cream sensation? Give your guests as many eye-popping choices as possible.